Wild raspberries have their origins in East Asia. The Crusaders brought the first cultivated variety from Turkey to the rest of Europe. Members of the rose family, raspberries are aggregate fruits, since they are made up of a number of smaller seed-containing fruits called drupelets. While the most commonly sold variety is the red raspberry, there are also yellow, black (these are different than blackberries), orange, amber, and white varieties, all of which are similar in flavour and texture to the red raspberry. 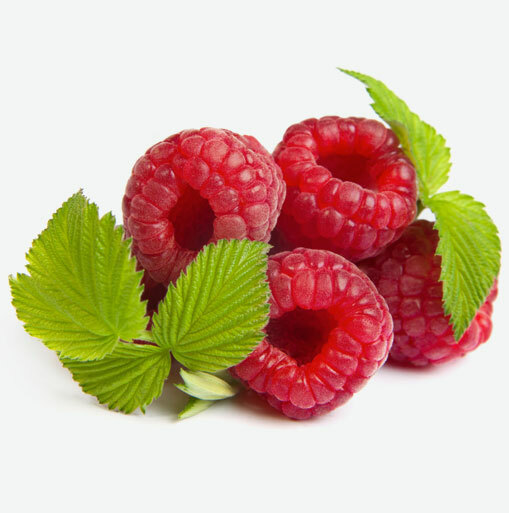 Raspberries are a natural source of the dietary supplement that is sold in most health food stores called ellagic acid. This tannin is viewed as being responsible for a good portion of the antioxidant activity of raspberries (and other berries). Raspberries are also a good source of vitamin C, which helps to maintain healthy gums and a strong immune system. Choose the freshest raspberries possible, since they are the most perishable and fragile of all the berries. Look for firm, dry and plump raspberries. Avoid berries that are shriveled or that have any trace of mold or mildew. When you take them home, refrigerate them right away. Fresh raspberries should be eaten with a day or two of purchase. Just before eating these delicious fruits, pick through them and discard any undesirable berries, then rinse them gently. Raspberries are mouth-watering at any time of the year. Fresh berries can be eaten as is, tossed into a fruit or vegetable salad, mixed with yogurt, cereal or cottage cheese, or made into jams, jellies and preserves. Frozen raspberries are ideal for smoothies or in recipes where the texture of fresh isn’t necessary. Mix fresh raspberries into creamy hot cereals. Top whole-wheat or oat pancakes with raspberries and low-fat yogurt. Whip up a fruit salad: toss together heartier fruit such as oranges, melons, apples and bananas, then top with fresh raspberries. Use raspberries in whole-grain muffins and quick breads.